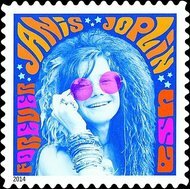 In it’s 5th installment of the music icon series, the Post Office will be releasing a Stamp honoring the great Janis Joplin. The image on the stamp will be from the cover of her “The Concert” album and you can expect the stamp to be available sometime in August. The Janis Joplin stamp is followed by Johnny Cash, Lydia Mendoza, Ray Charles and Jimi Hendrix, whose stamp was issued in March. About Janis- Born in Port Arthur Texas on January 19th 1943,Janis Joplin went on to become one of the worlds most influential singer/songwriters of all time. Leaving Texas for San Francisco, Janis complied multiple hits that spanned just over a few years, with each and every song becoming timeless. From her breakthrough appearance on June 1967 at the Monterey Pop Festival, to her legendary performance at Woodstock on August 16, 1969, Janis captivated audiences with her free spirited soul that reached the every single fan that watched her perform. On October 4th, 1970 she was found dead by producer Paul Rothchild at the Landmark Motor Hotel in Hollywood. Joplin’s will funded $2,500 to throw a wake party in the event of her demise. The party took place on October 26 at the Lion’s Share in San Anselmo, California It was attended by Joplin’s sister Laura, fiancé Seth Morgan, and close friends Jack Penty and road manager Cooke. Joplin was inducted into the Rock and Roll Hall of Fame in 1995, and was given a Grammy Lifetime Achievement Award in 2005.
the content of this article is freely licensed under the terms of Nicholas Vespucci.